As a professional cupcake illustrator, I am occasionally faced with requests which I imagine are not often encountered in other industries. 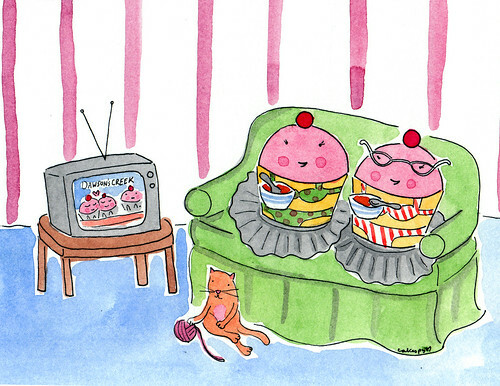 For instance, over the holidays, when customer Megan inquired if I would be able to create a painting featuring "Cupcakes in their underpants eating soup and watching Dawson's Creek...with a little orange kitten nearby batting at something?" ...let's just say my response was swift and confident (and, I might add, without any follow up questions): YES. Just another example of why I love my job. For more information on custom CakeSpy art, visit cakespyshop.com!